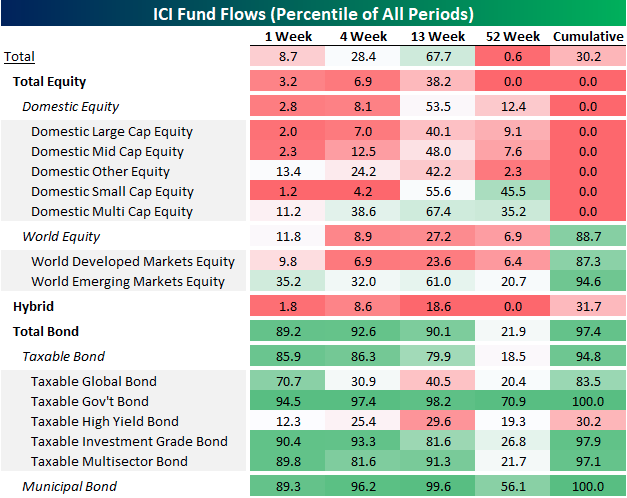 Despite negativity exhibited by equity mutual fund flows, the bond space has been thriving of late, with inflows to total bond funds better than 90% of all periods in the last three months, driven by taxable government bonds and municipal bonds. The most recent week saw very strong inflows to bond funds generally, mostly led by taxable government bonds but with a strong showing from investment grade credit, multi-sector bonds and municipal bonds. While equity ETF flows are showing some signs of a reversal from outflows to inflows of late, we’ll need to see a greater shift over the course of Q2 to suggest equity ETF flows are “improved”. When looking at the sentiment surveys and indicators, I think these late equity ETF inflows are just that, “Johnny come lately” and contrarian in nature. I’d be happy to be proven wrong nonetheless. Job gains for 102 months in a row, longest run in history (by over 2x). Unemployment Rate at 3.8%, near lowest level in last 50 yrs. Initial Claims and 4-week average at lowest level since 1969. New Home sales at 11-year high levels. 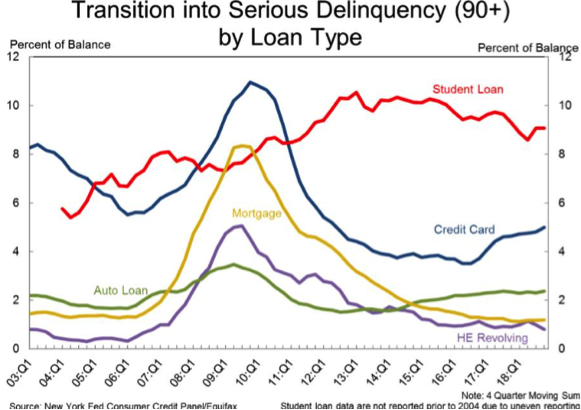 Delinquency rates at low levels across most credit categories. I could literally go on-and-on and tout various economic indicators and sentiment figures associated with a strong economy that won’t likely produce a recession in 2019. To add a more authoritative scope of why the current expansion cycle has disproven the naysayers and dispensed with the notion that expansion cycles have expiration dates, let’s take a look at what Bill McBride has to say about it. “The current U.S. expansion is currently the second longest on record, and it seems extremely likely that the current expansion will surpass the '90s expansion in a few months. Furthermore, with mortgage rates at their lowest level in nearly 14 months, it serves to figure that the improving housing sector data may have legs to further propel the economy in 2019. Remember, the housing sector has what we commonly refer to as the “pile on” effect. When you buy a house, you often buy a great deal of furnishings and goods to go into that house! Earnings Growth: For Q1 2019, the blended earnings decline for the S&P 500 is -4.3%. If -4.3% is the actual decline for the quarter, it will mark the first year-over-year decline in earnings for the index since Q2 2016 (-3.2%). Earnings Revisions: On March 31, the estimated earnings decline for Q1 2019 was -4.1%. Five sectors have lower growth rates today (compared to March 31) due to downward revisions to EPS estimates and negative EPS surprises. Earnings Guidance: For Q2 2019, 4 S&P 500 companies have issued negative EPS guidance and 1 S&P 500 Company has issued positive EPS guidance. Valuation: The forward 12-month P/E ratio for the S&P 500 is 16.7. This P/E ratio is above the 5-year average (16.4) and above the 10-year average (14.7). Earnings revisions have slowed with FactSet reducing their EPS estimate by .1% from a week ago. The blended (combines actual results for companies that have reported and estimated results for companies that have yet to report) earnings decline for the first quarter is -4.3% today, which is slightly smaller than the earnings decline of -4.5% last week. Positive earnings surprises reported by companies in the Financials sector were mainly responsible for the slight decrease in the overall earnings decline during the week. The blended revenue growth rate for Q1 2019 is 4.8% today, which is slightly above the revenue growth rate of 4.6% last week. Positive revenue surprises reported by companies in the Financials sector and upward revisions to revenue estimates for companies in the Energy sector were mainly responsible for the small increase in the overall revenue growth rate during the week. Some of the more pressing issues discussed by reporting firms already have been the strong U.S. Dollar and wages. Also of notable recognition has been the Q1 weather. For Q2 2019, analysts are projecting a decline in earnings of -0.4% and revenue growth of 4.2%. For Q3 2019, analysts are projecting earnings growth of 1.4% and revenue growth of 4.1%. For Q4 2019, analysts are projecting earnings growth of 8.3% and revenue growth of 4.7%. For CY 2019, analysts are projecting earnings growth of 3.4% and revenue growth of 4.6%. Now let’s take a look at the latest S&P 500 Q1 EPS estimates and more from Reuters/Lipper, which have also been revised lower on a week-to-week basis. First quarter earnings are expected to decrease 2.3% from 18Q1. Excluding the energy sector, the earnings growth estimate is -1.3%. Of the 29 companies in the S&P 500 that have reported earnings to date for 19Q1, 79.3% have reported earnings above analyst expectations. 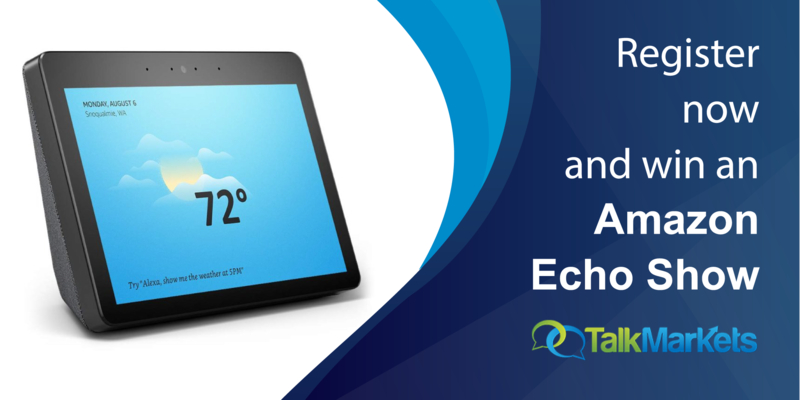 This compares to a long-term average of 65% and prior four-quarter average of 76%. 19Q1 quarter revenue is expected to increase 4.9% from 18Q1. Excluding the energy sector, the revenue growth estimate is 5.5%. 48.3% of companies have reported 19Q1 revenue above analyst expectations. This compares to a long-term average of 60% and an average over the past four quarters of 67%. 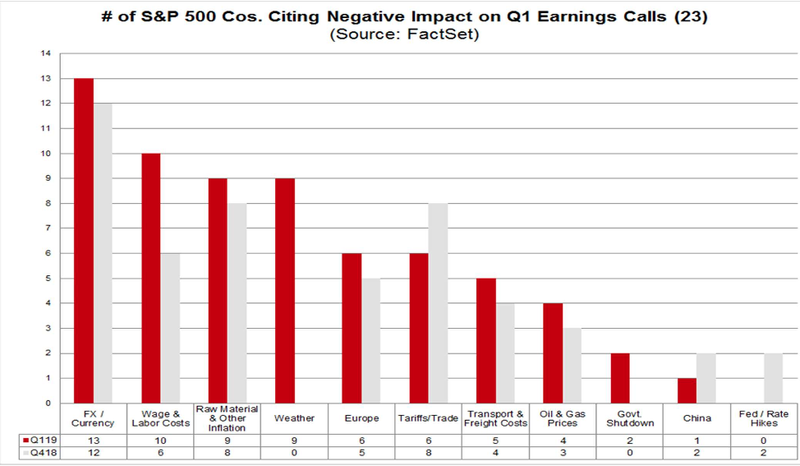 For 19Q1, there have been 85 negative EPS preannouncements issued by S&P 500 corporations compared to 31 positive, which results in an N/P ratio of 1.7 for the index. The forward four-quarter (19Q2 – 20Q1) P/E ratio for the S&P 500 is 16.8. During the week of Apr. 15, 50 S&P 500 companies are expected to report quarterly earnings.